That sense of intimacy and connection pervades everything Woodard does, from her solo acoustic shows to her duo performances with drummer Alex Hayward to her Riverside Arts Market kids’ stage sets with daughter Edie. When Woodard isn’t singing and strumming her guitar, she’s managing Chromatic Studios in Riverside, serving as an assistant for local photographers, and working as a massage therapist. Yes, she’s busy–but the Pittsburgh native says that state of constant motion is what keeps her centered. And when she takes the stage at cozy spots like Blue Jay Listening Room, to which she returns this Friday, Woodard finds strength in the chance to bare her soul by letting her honey-dipped voice soar. 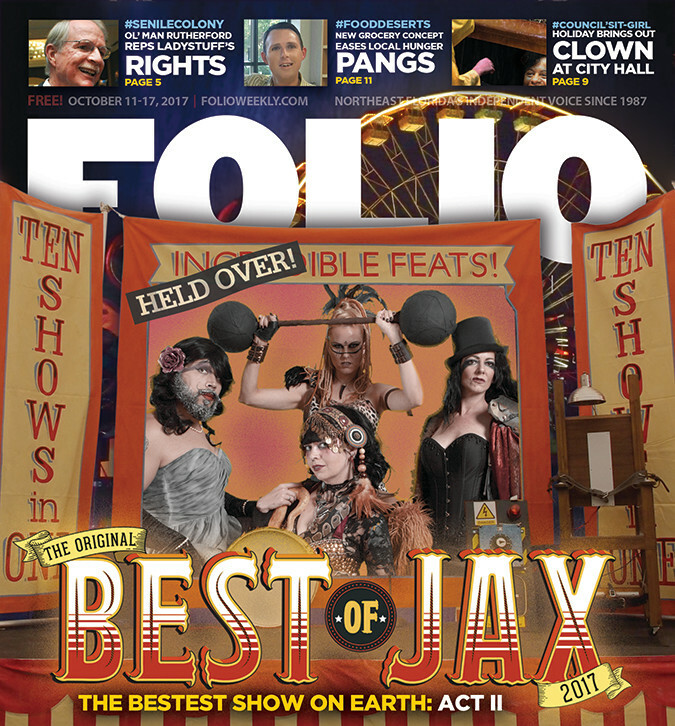 Folio Weekly caught up with her as she drove down A1A last week to see Jack Johnson and Bahamas at St. Augustine Amphitheatre. Folio Weekly: You’re a regular at Blue Jay Listening Room. What is it about that venue you like so much? Mere Woodard: It’s definitely my favorite–the heart and soul of what we do as singer/songwriters. [Blue Jay owner] Cara Burky is the biggest music fan you’ll ever meet, so when she had this vision, where you have a roomful of attentive audience members truly listening to the artist, I was totally onboard. She asked me to play the very first show, and it was my favorite show I’ve ever played. The connection is like nothing else. How does it differ from, say, performing at Florida Theatre or Ponte Vedra Concert Hall? It’s hard to even compare. The Blue Jay is more casual, more laid-back. More laughing together with the audience. Ponte Vedra and Florida Theatre are very humbling. I realize that the crowd is not necessarily there to see me, and I respect that immensely. I’m honored. When I played Ponte Vedra last, it was like, “I’m so glad to be here! Please don’t kick me off the stage–just let me finish my set.” [Laughs]. Your last album, Like the Sea, came out in early 2016. Have you been working on new material? It’s been hard. Like any writer, you sit down and say, “OK, now it’s time to write.” But sometimes I’m not ready to. A lot has happened since that album; I’ve had to adjust to life differently and figure out my relationship with music. But recently I am writing again, and I’ve got a collection of songs that I plan to record locally in Riverside at Chromatic Studios with my producer Alex Hayward. We’ve been doing weekly writing sessions and we’re definitely on our way. I might even do an EP since I have enough material for that right now. How is different working with an outside collaborator like Alex, especially given the personal nature of your songwriting? It’s different but great. Alex is a professor of sound technology at UNF, so his toolbox is much bigger than mine, which I love. I’ve been growing as an artist. My new sound might be a little different than before, and I’m excited about that. We’re looking into into adding some electronic stuff–not club music or anything crazy [laughs], but the times are changing. Music’s changing, and I’m inspired by so much that I hear. Is it tough to make it as a musician working in and around North Florida? I always joke that I have six jobs. Some days I feel like a chicken with her head cut off, running around living by my Google calendar. But music is a big part of my overall work. And I think I would be bored if I did the daily drive to work, sit in a cubicle, and drive-home grind. I love that my life looks different every day of the week. I really thrive on that. What moments do you thrive on as a performer? I touched on this in an interview I did recently for WJXT Channel 4. You wonder, “How do I know this is for me?” And the best answer I can come up with is, something calls you to do this, and when you feel those snippets of success, you say, “Wow, this is amazing!” Whether you’re in the privacy of your own home or up on stage, when you open your eyes and forget where you are, it’s truly like a meditation. We’re all constantly searching for that energy, and music is how I tap in to it. Do you hope to expand your profile regionally or even nationally? That’s the ideal dream–bring it on! But if not, that’s OK. When I first got into the groove playing music, I thought, “Maybe I could really do this!” Now I’m at peace with whatever happens. If playing locally is what success looks like for me, I’m cool with that. Either way, music still feeds me.